The message passing standard MPI is a language-independent communication protocol. 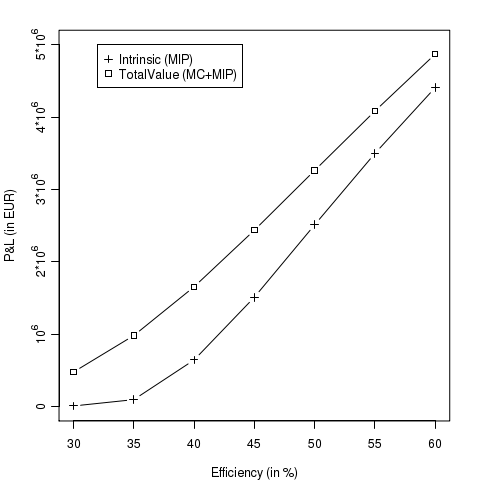 MPI supports the parallelization of numerical algorithms on both massive parallel computers and on symmetric multi processor systems. MPI is standardized, highly portable and the de facto standard on massive parallel supercomputers. Even though MPI can be used in a multi-threading environment it is normally used in a multi-process environment. Therefore MPI is tailor-made to parallelize algorithms based on the non thread-safe QuantLib. The roots of the MPI specification are going back to the early 90’s and you will feel the age if you use the C-API, which is designed to achieve maximum performance. The Boost.MPI library – quoting from the web page – “is a C++ friendly interface to the standard Message Passing Interface… Boost.MPI can build MPI data types for user-defined types using the Boost.Serialization library”. Model calibration can be a very time-consuming task, e.g. the calibration of a Heston or a Heston-Hull-White model using American puts with discrete dividends. The class MPICalibrationHelper acts as a MPI wrapper for a given CalibrationHelper and allows to parallelize an existing model calibration routine (hopefully with minimal impact/effort). The source code is available here. It contains the MPICalibrationHelper class and as an example the parallel version of the DAXCalibration test case (part of test-suite/hestonmodel.cpp). The code depends on QuantLib 1.0 or higher, Boost.Thread and Boost.MPI. 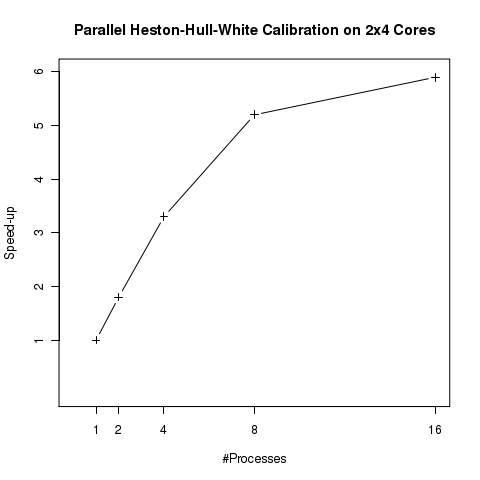 The diagram above shows the speed-up of a Heston-Hull-White calibration with discrete dividends on an eight core machine using a finite difference pricing engine. The main reason for the sub-linear scaling is the limited memory bandwidth between the CPUs and the main memory and not the MPI communication overhead. Even the pricing of a simple virtual power plant (VPP) is challenging. Main reasons are the high number of possible states of the VPP and the large number of possible exercise dates because often a VPP is priced as a bermudan-style option with hourly exercise rights. 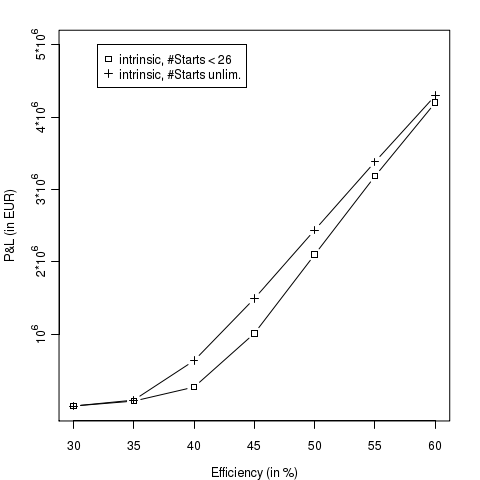 The implementation effort for an exact pricing engine based on finite difference methods (see e.g.) or based on least squares Monte-Carlo is comparable large. As shown in  Monte-Carlo combined with perfect foresight optimization can result in a very good approximation. The algorithm consists of a Monte-Carlo path generator and a dynamic programming optimization part, which calculates the optimal load schedule plan for each path separately. The stochastic processes involved are outlined in . 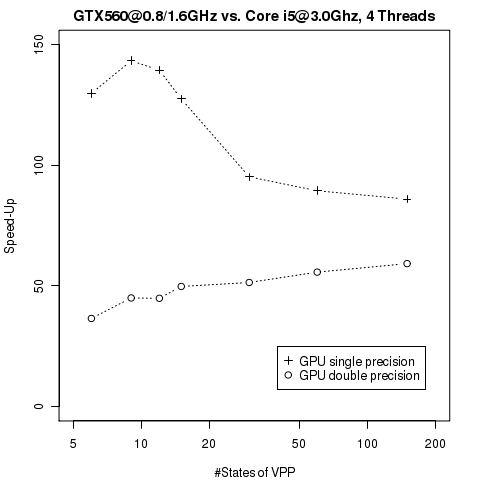 As can be seen in the diagram below the GPU outperforms the CPU roughly by a factor 100 for single precision and a factor of 50 if the GPU is using double precision. Size nSimulations: number of Monte-Carlo simulations carried out. Size blockSize: number of threads in a CUDA block. Size gridSize: number of CUDA blocks that are grouped together in a simulation kernel. The CUDA implementation consists of two kernels. The first kernel is the Monte-Carlo path generator, which calculates the paths on hourly granularity and stores them in the global memory of the graphic card.. The technics used are outlined e.g. in ,  and . The second kernel performs the optimization of the load schedule based on dynamic programming. The memory layout of this step depends on the number of possible states of the VPP because every possible state is stored in the shared memory of the GPU. The number of states is given by . CUDA does not support efficient dynamic shared memory allocation. Therefore the sizes of all shared memory arrays must be given at compile time. To allow an optimal use of the limited shared memory capacity different kernels with different values are generated using X-macros and the appropriate kernel is chosen at runtime. defines basic CUDA types, especially the typedef for the type “real” can be used to compile the code either for single or double precision. implementation of the GPURand interface based on the CURAND library, which is part of CUDA 4.0.
 this blog, VPP Pricing III: Exact Pricing based on Finite Difference Methods. L. Howes, D. Thomas, Efficient Random Number Generation and Application Using CUDA. The total value of a virtual power pant (VPP) can be decomposed in an intrinsic part plus an extrinsic part. The intrinsic value is given by the cash-flows that the VPP would generate based on the current power and gas forward curve. Therefore the intrinsic value can be calculated without defining a stochastic model for the power and gas prices using either linear or dynamic optimization methods. Calculating the extrinsic value implies pricing the VPP exactly to calculate the total value for a given stochastic process. The model in use here is outlined in the article VPP Pricing I: Stochastic Processes & Partial Integro Differential Equation. Exact pricing can be done using least square Monte-Carlo or finite difference methods using dynamic programming for the local optimization . An additional fourth dimension is needed to keep track of the different states of the VPP. Based on the characteristics of the VPP type outlined in the article VPP Pricing II: Mixed Integer Linear Programming a VPP with three possible load levels has different states. and optimize the power plant load schedule for each path separately in the same way the intrinsic value is calculated. This procedure will result in an upper bound for the exact price of the VPP. 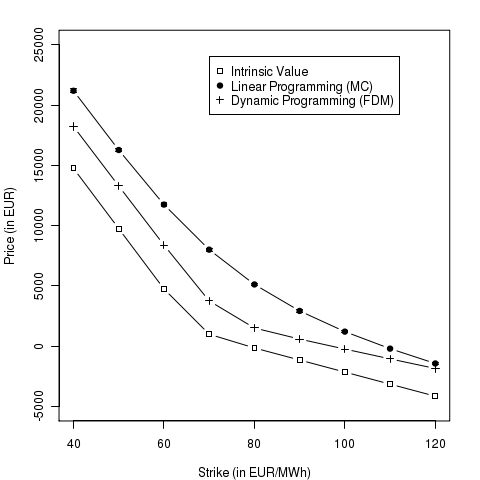 The prices for a 4 weeks VPP contract based on this two methods and with the parameters outlined in VPP Pricing II show almost no differences between the “exact” finite difference method and the perfect foresight upper bound value beside the Monte-Carlo error (s. diagram below, compare with ). H. van Dijken, D. van Abbena, H.S. Los, C. de Jong, The value of starting up the power plant. The next two steps are defining a simple VPP contract (or a simplified gas-run power plant) and setting up a mixed integer linear programming optimization (MIP) to calculated the intrinsic value and an upper bound for the extrinsic value based on a Monte-Carlo simulation and assuming perfect foresight. The third step outlined in the next part will then be the “exact” pricing of the extrinsic value using dynamic programming and finite difference methods. Ramp rates will be neglected, but the power plant has a minimum uptime and a minimum downtime . The start-up costs are given by a fixed start-up cost (in €) and the price of the gas needed to produce the start-up heat (in MWh). For a one year span the problem consists of decision variables and constraints. This comparable small problem can be solved using e.g. the Gnu Linear Programming Kit (GLPK). For an overview on open source linear/mixed integer programming solver see . the (fixed) carbon dioxide price is 3.0€ per MWh heat. The source code is available here. It depends on GLPK and the latest QuantLib version from the SVN trunk or the next QuantLib 1.2 release. The following diagram shows the results for and a minimum load . The source code is available here. It depends on QuantLib 1.1 and if you want to generate the plot directly from the C++ program you’ll also need R, RCPP and RInside. S. R. Thorncraft, Evaluation of Open-Source LP Optimization Codes in Solving Electricity Spot Market Optimization Problems. 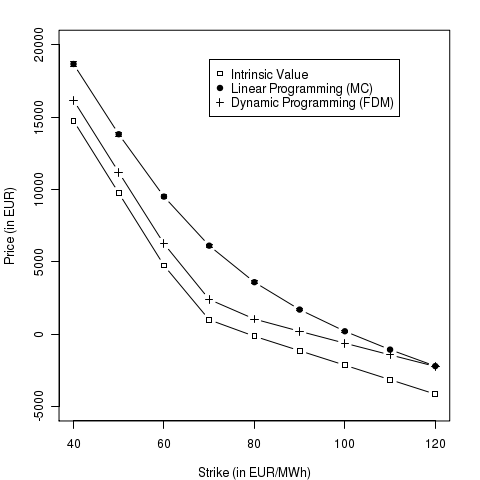 In order to get an improved impression on the differences between Monte-Carlo/linear programming and finite difference methods/dynamic programming a more realistic swing option with hourly payoff profile is evaluated based on a German hourly forward curve. 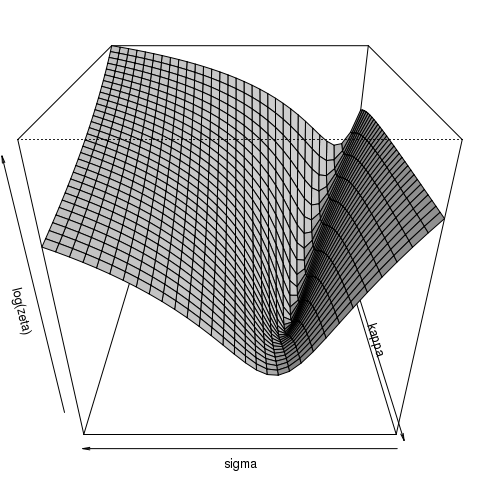 The forward curve is taken from the Kyos example download page. The parameterization of the Kluge model is outlined in . The size of two dimensions of the finite difference method (dynamic programming) is therefore already been given. 2016 steps are needed in time direction and 500 steps are needed in the “consumed exercises” direction. Together with the two other directions – one for the power price and one dimension for the jump process – and without further simplidsfications this forms a pretty large finite difference problem. 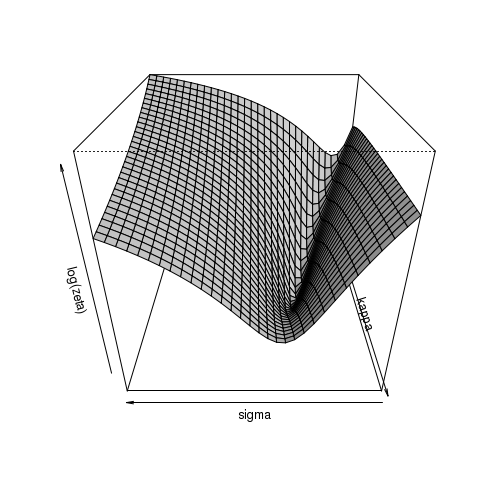 The Monte-Carlo based linear programming approach reduces the computational burden but will lead to an upper bound of the swing option price. 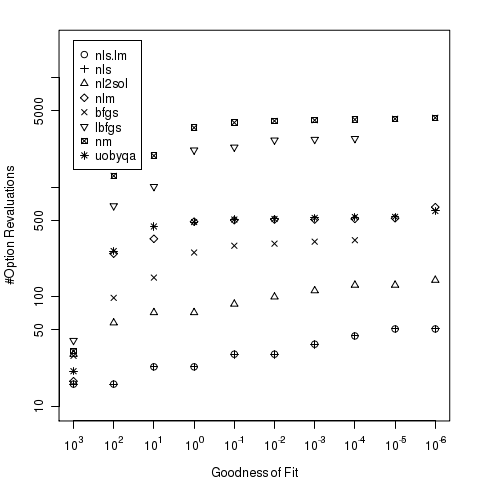 The diagram below shows the corresponding results. 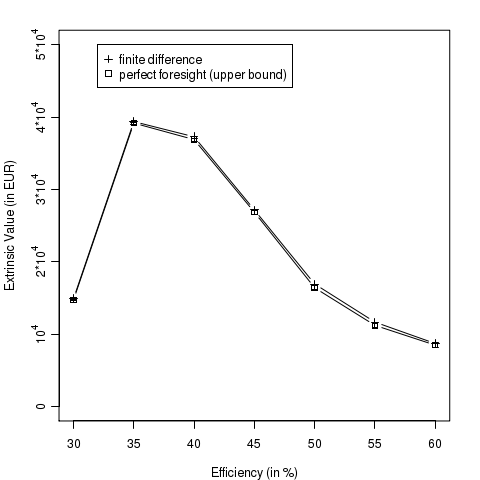 Finding the optimal exercise strategy for a swing option is a challenging task, even for simple payoff structures. In the absence of complicated time-integral constraints dynamic programming can be used to calculate the optimal exercise strategy. Linear programming applied ex post over the whole spot price path is capable to deal with more complicated time-integral constraints but the algorithm leads only to an upper bound of the real option price . A Gauss-Laguerre quadrature is appropriate to calculate the integral part of the PIDE. Beside this two-dimensional PIDE an additional dimension is needed to keep track of the already consumed exercise rights. The three-dimensional formulation together with Bellman’s principle of optimality transforms the global optimization problem into a local optimization problem. 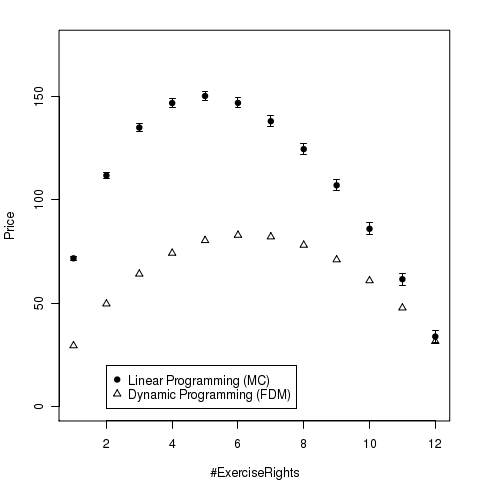 The linear programming algorithm will calculate the optimal exercise strategy on each Monte-Carlo path separately (perfect foresight) with respect to the given constraints. For this basic type of swing option linear programming is sort of over-engineering because a simple sort algorithm will also reproduce the optimal exercise strategy. But introducing linear programming and mixed integer programming now will enable us later on to deal with more complicated time-integral constraints. Libraries for this task are freely available, e.g. the GNU Linear Programming Kit. the example swing call option has maturity of one year, strike price is equal 40, one exercise opportunity per month and the minimum number of exercise rights is equal to the maximum number of exercise rights, . Interest rates are at . As the diagram above shows for this set-up the upper bound for the swing option price calculated using linear programming differs significantly from the correct price calculated based on dynamic programming on a lattice. For twelve exercise rights both algorithms have to provide the same results because the constraint forces to always exercise on each exercise date. Next to come is to rerun the simulation with a more realistic forward curve and process parameters. The code is available here. It depends on the GNU Linear Programming Kit, the Boost Thread library for parallelization and at the time of writing on the latest QuantLib version from the SVN trunk. If you want to generate the plot directly out of the C++ program you also need R, RCPP and RInside. The parameter set is supposed to be piecewise constant in time. This model has a semi-closed solution for plain vanilla European put/call options based on the characteristic function method . leading to a goodness of fit measure of (Please keep in mind that this result is the outcome of a naive calibration procedure. Due to the large and values I’d not use these parameters to price a derivative.). To be able to compare a larger number of deterministic optimizers the model calibration will be carried out using R and with help of the additional packages minpack.lm and minqa. nl2sol:based on the PORT library. bobyqa:trust region method that forms quadratic models by interpolation. newuoa: trust region method that forms quadratic models by interpolation. uobyqa:trust region method that forms quadratic models by interpolation. The particular result dependents on the starting vector but the following diagram shows a common outcome. The best methods are the non-linear least square algorithms nls.lm and nls followed by nl2sol. Algorithms not included in the diagram have performed even worse than “nm” for this problem. 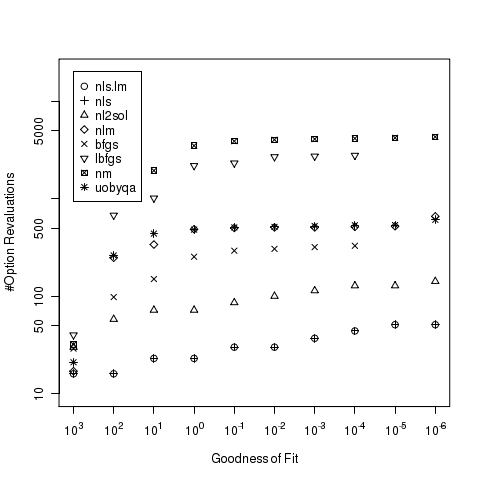 The goodness of fit measure is calculated in C++ based on the QuantLib and exposed to R using RCPP. The C++ code and the R scripts to perform the optimizations and to create the plots can be found here. A. Sepp, Pricing European-Style Options under Jump Diffusion Processes with Stochastic Volatility: Applications of Fourier Transform.